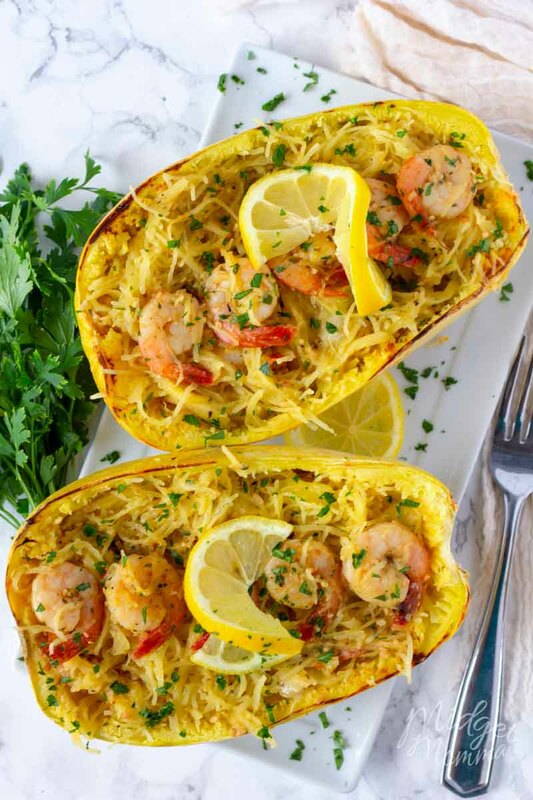 There are so many spaghetti squash recipes that I love, and my newest love is this amazing Shrimp Scampi Spaghetti Squash! 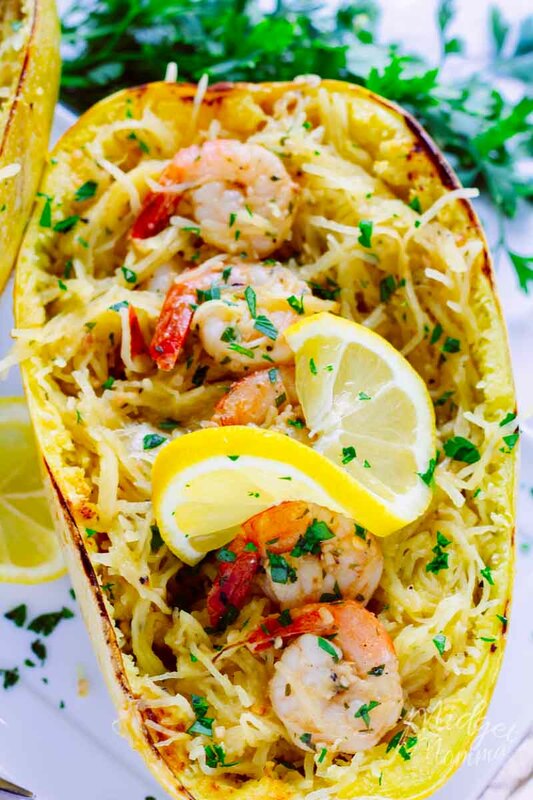 You can have an amazing shrimp scampi dinner in less then 30 minutes with this easy Shrimp Scampi Spaghetti Squash recipe! This low carb Shrimp Scampi is the perfect healthier alternative to a shrimp scampi pasta dish, but it still has the buttery garlicy flavors we all love! 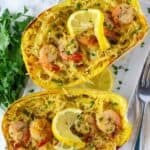 This is one of our favorite shrimp spaghetti squash recipes and we make it often because everyone clears their plates when I make it. 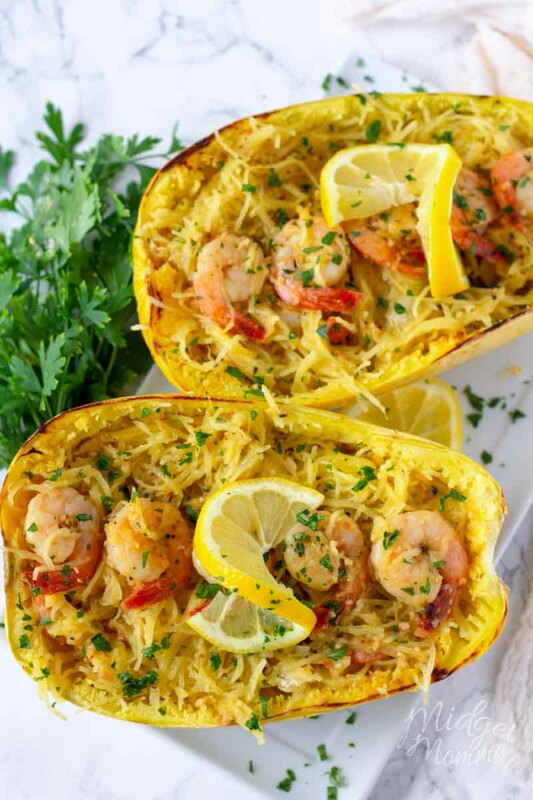 If you have never had spaghetti squash and shrimp you are missing out on an amazing flavor combination that you need to try! 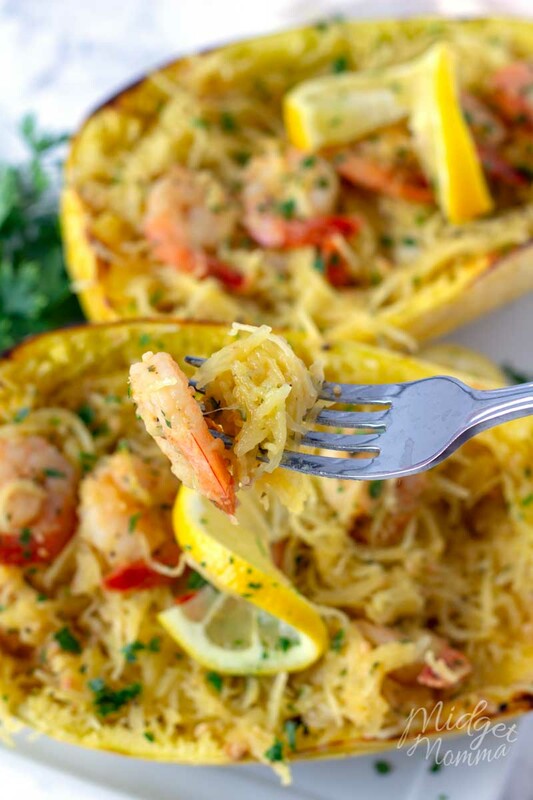 This low carb Spaghetti Squash Shrimp Scampi is the perfect healthier alternative to a shrimp scampi pasta dish, but it still has the buttery garlicy flavors we all love! Cut your squash in half vertically. Drizzle the flesh side of the squash with the oil, salt, and pepper. 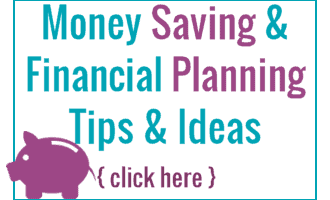 Place them cut side down on an aluminum foil lined sheet pan. Bake for 30 minutes, or until tender. Remove the squash from the oven and gently break up the flesh into noodles. Place the spaghetti squash noodles into a large mixing bowl, set aside. Heat butter and oil in a large skillet over medium heat. Stir in the garlic and cook for one minute until it starts to soften. Place the shrimp into the pan and cook until the shrimp have turned pink about 5 minutes. Deglaze the pan with the white wine and add in the lemon zest, lemon juice, salt, and pepper. Continue to cook for an additional 5 minutes. Stir in the parsley and pour the sauce over the spaghetti squash, stir to combine. Place the mixture back into the squashes shells and enjoy. It was good with exception of seeds. Quite comical I did not think to pick them out before scooping it out of the shell. Which temperature do you cook the squash at?